To name a consultancy after an abstract concept might seem odd when the focus is very much on practical applications of academic research. But the idea of requisite variety is so powerful — indeed, so fundamental — to a systems approach to design and human behaviour that it seemed entirely appropriate, if potentially typo-prone as a domain name. So what is requisite variety? 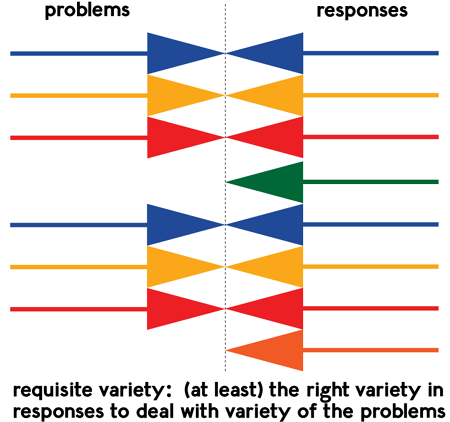 Informally, practically, it says that in order to deal properly with the diversity of problems the world throws at you, you need to have a repertoire of responses which is (at least) as nuanced as the problems you face. Ross Ashby, a pioneer British cyberneticist and psychiatrist, formulated his law of requisite variety in the context of regulation in biology — how organisms are able to adapt to their environment — and then, in quick succession, to aspects of Claude Shannon’s information theorem, and systems in general. Such interdisciplinary bridges were characteristic of the cybernetic approach. Stafford Beer extended the concept to help analyse the structure and management of organisations and whole societies. 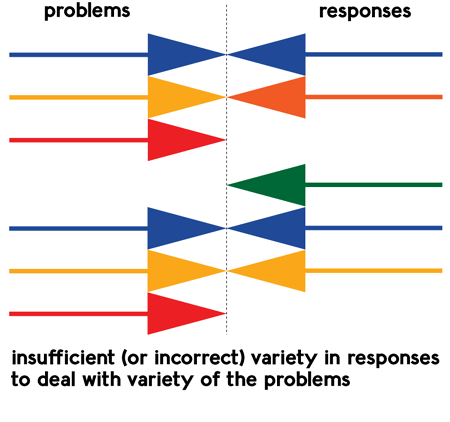 Basically, the responses available need — at least — to match the problems, to be able to deal (cope?) with them. There are probably better ways that the concept could be illustrated, of course. Daniel Scholten’s approach to the concept [PDF] might suggest something like a set of keys of different shapes matching a set of locks. Some people would, quite rightly, take issue with the notion of ‘problems’ and ‘responses’ as discrete, atomic units, when in reality, if (the rest of) cybernetics and systems approaches have taught us anything, it’s that a) the process of framing the problem is an inescapable part of the ‘response’, and b) ‘responses’ often create their own problems. I accept all of that, but the basic point remains that we need to have a nuanced repertoire of ways of dealing with problems, one that properly takes into account the variety of problem contexts. This, really, is a direct practical implication of requisite variety for design and behaviour change. Maybe it is tautological, or even trite to have to spell it out, but many approaches to ‘behaviour change’ — in as broad a scope as we might draw — try to solve problems using a very non-nuanced approach. Designers necessarily model users, and those models can make a lot of assumptions [PDF] about how to ‘solve’ behaviour-related problems. ‘The answer’ to ‘sustainability’ or ‘health behaviour’ is ‘gamification’ or ‘changing public attitudes'; no, the answers need to come from actually understanding the problems, and the contexts in which people live their lives, and responding in ways which take account of those contexts. Even if we can’t do that as deeply as we would like, we need variety in our repertoire of responses. We need a crossdisciplinary perspective that learns from knowledge and practice in lots of different fields rather than assuming that any one arbitrary discipline has ‘the answer’. We need to appreciate commonalities, patterns, similar characteristics and the differences between situations and contexts. 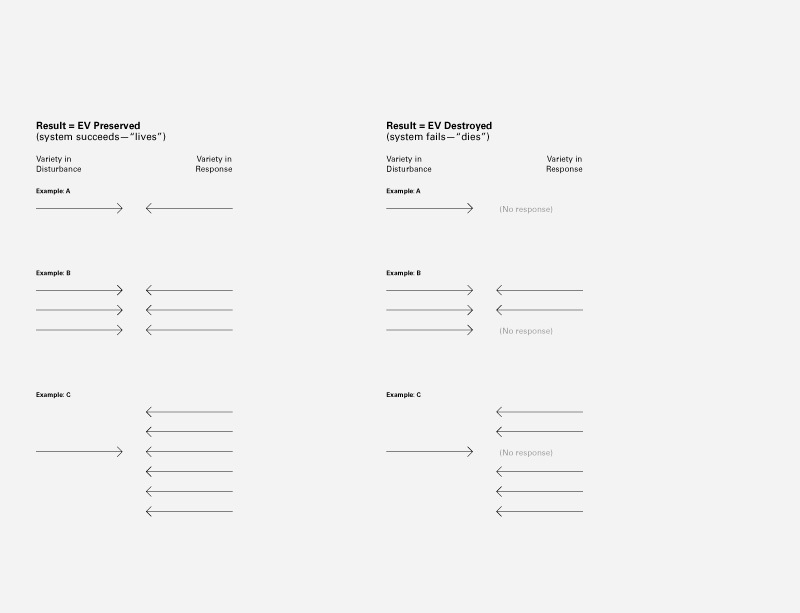 The Design with Intent toolkit aims to be a basic start along that path; future developments will (hopefully) enable those more nuanced links between problem contexts and applicable responses, via researching and designing with people rather than just for them. Methods such as heuristics, and some others under development, ought to help. Requisite variety is an aspiration, an ideal state rather than something any designer working with human behaviour can honestly claim to offer. But we need to try. Based in south-west London, Requisite Variety provides consultancy at the interface between people and designed systems, across products, services and environments. Get in touch: dan@requisitevariety.co.uk or @danlockton. Powered by WordPress. This site uses the Platform template from Pagelines.